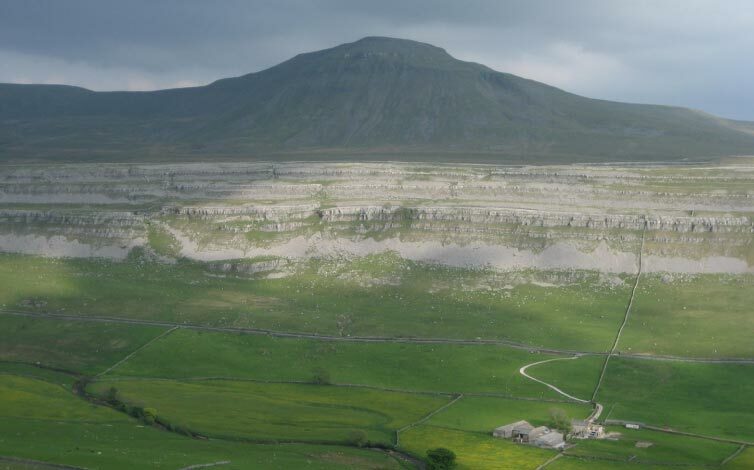 Scars and pavements of gleaming white limestone are synonymous with the Yorkshire Dales, and the Ingleborough area in particular, where some of the country’s finest and most famous examples of ‘karst’ features can be observed and enjoyed. The limestones were laid down during the Carboniferous Period some 340 million years ago. At that time, what is now the Ingleborough area lay basking somewhere near the equator and beneath a warm, shallow sea – rich in small ‘shelly’ creatures and corals. When these creatures died, their remains, consisting mainly of calcium carbonate, were built into a massive layer over an equally massive period of time, and were compressed to form the familiar grey/white rock so distinctively forming the great plateau on which Ingleborough rests. The Great Scar Limestones around Ingleborough are more than 200 metres (650ft) thick, and Chapel-le-Dale is an ideal location to view the varying bands of limestone that make up what we collectively call the ‘Great Scar’. These subtle differences are a result of variations in sea level and deposition and are explained in more detail in the section called Great Scar Sandwiches. Of special interest on Ingleborough is the very narrow Porcellanous Band separating the Cove and Gordale Limestones and formed in a very shallow lagoon. The band is particularly easy to see inside the Main Chamber of Gaping Gill. The strength of limestone has been exploited by people for generations in the Dales. 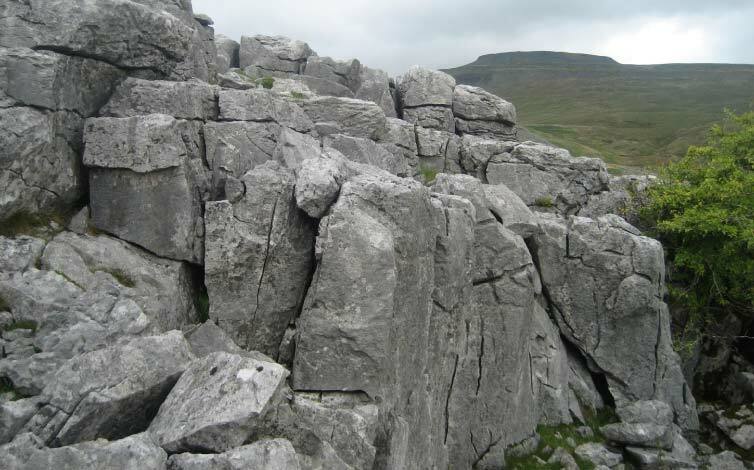 The unique properties of this beautiful rock are responsible for the great number and variety of karst features around the Three Peaks. The fact that limestone is extremely durable, yet very slowly soluble in water, means that a wonderfully diverse landscape of towering scars, pristine pavements and awe-inspiring pothole shafts has been allowed to form in all its glory.